Hotelyear built 1990 year remodeled 2001additional property description the best western abbey hotel golf and country club is set in 175 acres of north worcestershire countryside, after a four million pound refurbishment this friendly hotel has an excellent restaurant, health club and an 18 hole golf course. we are close to birmingham international airport and the nec. free parking and conference facilities for up to 160 are available. 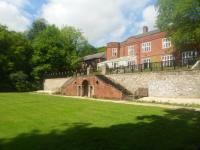 Menzies Hotel Birmingham - Stourport Manor is a refurbished country house with 23 acres of beautiful grounds. There is a swimming pool, an outdoor tennis court, free Wi-Fi, and a restaurant with buffet breakfast. The Abbey Great Malvern is located in Malvern, England, 200 metres from the town centre and two miles from the Malvern Hills in the Cotswolds. Worcester city is 10 miles from the hotel and Great Malvern train station is one mile away. Hotel Features. Surrounded by gardens, The Abbey is a 19th century property overlooking the Malvern Hills and the Vale of Evesham. The Hampton Inn Detroit/Southfield is located in Southfield, Mich., a suburb north of Detroit. The hotel is 10 miles from MGM, Motor City and Greektown casinos. The Southfield Civic Center is one mile from the hotel. The Detroit Zoo is four miles away. The Hampton Inn Detroit/Southfield serves complimentary continental breakfasts each morning. This Michigan hotel's lobby includes a fireplace and seating area. 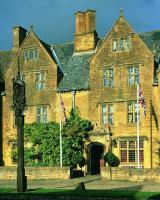 The Barceló Premium Lygon Arms Hotel is located in the village of Broadway, Worcestershire, England. Shakespeare's birthplace, Stratford upon Avon, is 23 miles away. Hotel Features. Set around a courtyard, this boutique hotel is housed in an historic coaching inn dating from the 16th century, and is surrounded by three acres of lush grounds which incorporate floodlit tennis courts, and a croquet lawn. The Quality Hotel Redditch is located in Redditch, England. Half a mile from Redditch train station 9.5 miles from Stratford upon Avon 10.5 miles from the National Exhibition Centre (NEC) Hotel Features. Manor house set in six acre grounds Complimentary parking on site Wireless Internet throughout (surcharge) Restaurant and lounge bar Conservatory with panoramic views Guestrooms. Located in the heart of historic Worcester, this 16th Century coaching inn has striking period features including a sweeping staircase, stained glass windows and carved doorframes. A complete recent refurbishment ensures you a consistently comfortable stay, with all modern facilities and a fresh and contemporary feel.Foregate's Brasserie, is relaxed and informal, with air conditioning for your comfort.